Ebrahim Yarmohammadi, M., Saderi, H., Shahrokhtabar, T. (2010). Presence of Cytomegalovirus in Sinunasal Mucosa of Patients with Chronic Sinusitis and Without Sinusitis. Iranian Journal of Pathology, 5(1), 14-17. Mohammad Ebrahim Yarmohammadi; Horieh Saderi; Tahere Shahrokhtabar. "Presence of Cytomegalovirus in Sinunasal Mucosa of Patients with Chronic Sinusitis and Without Sinusitis". 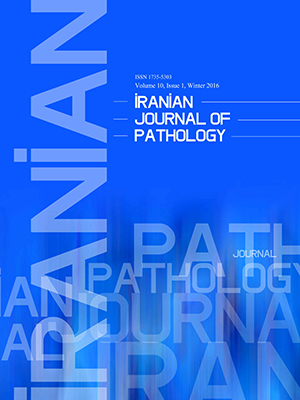 Iranian Journal of Pathology, 5, 1, 2010, 14-17. Ebrahim Yarmohammadi, M., Saderi, H., Shahrokhtabar, T. (2010). 'Presence of Cytomegalovirus in Sinunasal Mucosa of Patients with Chronic Sinusitis and Without Sinusitis', Iranian Journal of Pathology, 5(1), pp. 14-17. Ebrahim Yarmohammadi, M., Saderi, H., Shahrokhtabar, T. Presence of Cytomegalovirus in Sinunasal Mucosa of Patients with Chronic Sinusitis and Without Sinusitis. Iranian Journal of Pathology, 2010; 5(1): 14-17. 1Dept. of Ear, Nose and Throat, Shahed University, Tehran, Iran. 2Dept. of Microbiology, Shahed University, Tehran, Iran. Background and Objective: Sinusitis is one of the most common hygienic problems and a large part of the budget has been allocated to its diagnosis and treatment yearly. In this study, the presence of cytomegalovirus in sinuses of patients, undergone operation for treatment, with or without sinusitis, was studied. Materials and Methods: This study was an applied and case-control study, which had been performed on 44 HIV negative patients in ENT clinic of Shahid Mostafa Khomeini Hospital in Tehran during 4 months in 2005.Biopsy specimens were taken from left and right of uncinet process mucosa of middle meatus of 22 patients with chronic sinusitis and 22 patients without sinusitis undergo operation for nasal septal deviation. After purification of DNA, PCR test was done for replication of early gene in cytomegalovirus DNA by two kits, which was purchased from Cinnagen Co. and Gen Fanavaran Co. Results: After the electrophoresis of PCR product on agarose gel, neither of samples has shown DNA band same the positive control enclosed in kits. Therefore, all specimens were considered negative for cytomegalovirus DNA. Conclusion: Cytomegalovirus has not been detected in sinunasal mucosa of patients with chronic sinusitis and without sinusitis. Test with more specimens and other diagnostic procedure are recommended for prove of absence of cytomegalovirus in sinunasal mucosa.